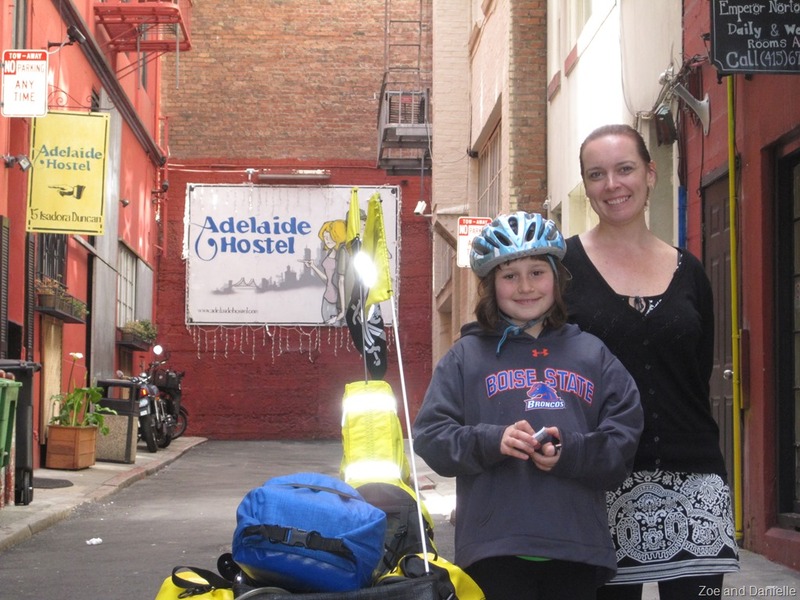 We said goodbye to the friendly folk at the Adelaide Hostel and set out for Half Moon Bay via Golden Gate Park to see if there was any way to experience the Japanese Tea Gardens without losing our trikes and everything on them. Climbing the steep hills east of the park the lower (easier) gears began jamming again. Oh yeah, that problem. We had a few tense moments stuck on a steep grade on 17th near Castro St but eventually managed to get everything unstuck and pointing downhill again. Thinking it better to debug the problem with the backup of a bike shop, we picked a shop downhill from us and (mostly) coasted there. Eric at The Freewheel on Valentia St was very accommodating, altering his schedule to help us out on the spot, but also was unable to detect anything wrong. Then it occurred to me to check the vertical alignment of the wheel and sure enough it was visibly off. Technobabble alert, skip to next paragraph! Unlike a conventional bike or even most trikes, the rear section of the Trice is a separate piece from the main frame. They are connected by sleeved tubes secured with a pinch collar which allows the rear wheel to pivot relative to the front wheels along the longitudinal axis. Having the wheel canted off of vertical would create a chain alignment problem that would be worst for the bigger rear sprockets. And under-tightening the bolts on the pinch collar would allow a sudden rotation of the rear wheel under the stress of a big SFO hill. It all made sense. I realigned the wheel and did a quick test ride and everything seemed fine. While I was at the shop I had Eric replace the worn center chain ring which I never got around to doing. He also adjusted my front derailleur which had been driving me nuts. Thanks Eric! By this time Half Moon Bay was out of the question so we reserved a room at the Traveler’s Inn in South SFO and headed for Golden Gate Park. I asked some local cyclists about the best route and they told me about The Wiggle. The Wiggle involves zig-zagging your way up a hill in a manner that minimizes the grade. This seemed like more of a philosophy—maybe a survival technique—than a specific route but seemed right up our alley so we wiggled our way to Golden Gate Park. Of course there is no way to secure a trike and gear at the tea gardens so we headed on down the road after splitting a hot dog from a street vendor. And half way up the next hill my gears began jamming again. Grrrr. Was my theory blown? Stay tuned. We mashed our way up the remaining hills, including the hill that appears to define Daly City (they seem pretty proud of that hill), to our destination. On the way down the Daly City hill we lost our pirate flag. A local cyclist spotted this while in his car and retrieved it for us. Thanks Mike! Kurt, check for my rather lengthy email that suggests some possible problems and cures for your shifting problem. Front or rear der? Rear der, sorry. Thanks for the tips, I’ll reply directly! Yes, your theory is blown. When the rear rotates, the derailleur rotates with it and shifting should be unaffected. You need to look for something else. If the derailleur is really running properly then a munched cable housing is usually the culprit followed by contamination in the housing. At least you can check that by disconnecting the cable and checking how smoothly it moves by pulling the cable back and forth within the housing. I think the jury is still out on the rotation theory but there is a piece of information you’re missing, coming in the next post. The problem is solved, at least as far as our current location in Monterey. Thanks for the tips Chip, I’ll double-check the cable movement. Glad you got back on the road… bummer about the technical problems! Hope you find a solutions soon. I don’t know much about Ice Trikes, I know that my terratrike chain routing can sometimes give me fits too.